YouTube is launching a new set of fundraising tools which will enable creators to raise awareness, and money, for their chosen organizations via the video platform. 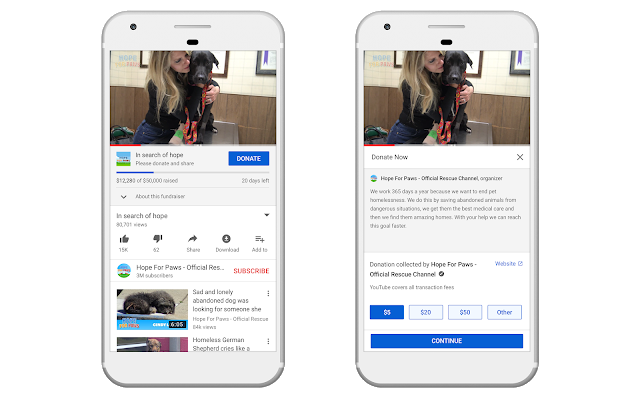 The first element YouTube is testing is called simply ‘Fundraisers’, and it’ll enable YouTube creators and registered non-profits to create and embed fundraising campaigns right next to their videos and live streams. The option is in limited testing, with YouTube covering all transaction fees in the initial period - meaning that 100% of the donations go to the relevant organizations. YouTube’s also rolling out ‘Community Fundraisers’, which enables multiple creators to co-host the same fundraising event or initiative. As you can see in the example video above, St Jude’s Cancer Research Hospital is using the option to team up with YouTube gaming celebrities in order to raise funds for the organization as part of Childhood Cancer Awareness Week. When you view content from participating gamers during the event, you’ll be able to see the collective total raised, and donate as you watch. And the last new addition from YouTube is ‘Super Chat for Good’, which will enable creators to raise funds for nonprofits via the YouTube live-streaming Super Chat payment system. As social platforms become a more significant part of our connective process, it’s good to see them working to provide more ways to provide societal benefit – particularly in a time where many are questioning the benefit such platforms do or don’t provide, and whether they actually are helping to better connect us. YouTube, at 1.8 billion monthly active users, has huge reach, and potential of such tools is great. If you’re a non-profit organization, it’s worth looking into these new tests, and keeping an eye on the platforms updates and evolutions.